It was a busy day. I took this shot in the early morning in Oshino. I slept for a couple of hours and left Fujiyoshida to Tokyo. First, I visited Shinjuku. The area close to the west entrance of Shinjuku (A.K.A. Shinjuku Nishiguchi) is the best place to buy camera gear in Tokyo. Then, I went to Nikon’s Service Centre in Ginza to have them clean the sensors of my Nikon cameras. There are many camera-related shops and galleries in Shinjuku and Ginza areas. Great places for photo enthusiasts. This entry was posted in Event, Mt. 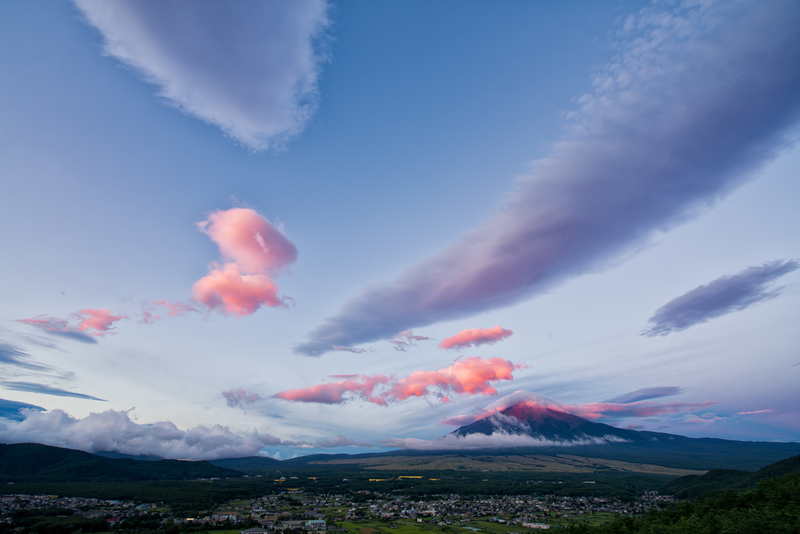 Fuji and tagged d800e, Google+, Island Gallery, エリティエ, スイーツ, センサー清掃, ニコン, 三人写真展, 白山, 銀座 on 08/24/2014 by yuga. Do evening primroses really look very well in the landscape of Mt Fuji? Japanese literary giant in the Taisho/Showa era, Osamu Dazai wrote in his popular novel “Fugaku Hyakkei (One Hundred Views of Mount Fuji)”, “Tsukimisou (evening primroses/oenothera tetraptera) really look very well in the landscape of Mt Fuji.” Honestly speaking, I’ve never read any English translation of the novel, so I’m not sure if the exact same sentence actually appear in your book. Anyway, he said something like that. But, in fact, he didn’t see Fuji and evening primroses together with his eyes. When he was returning from Fujiyoshida to Misaka Touge, he witnessed people on the bus were very delighted to see magnificent Fujiyama through the windows. Then he found an old woman sitting on the other side of the bus gazing at the other side from Fujisan. Dazai sympathised with the old woman. He did the same and saw evening primroses blooming on the other side from Fuji, and then, said “Evening primroses really look very well in the landscape of Mt Fuji.” Meaning that, he never saw evening primroses together with Fuji in the same landscape. This entry was posted in Mt. 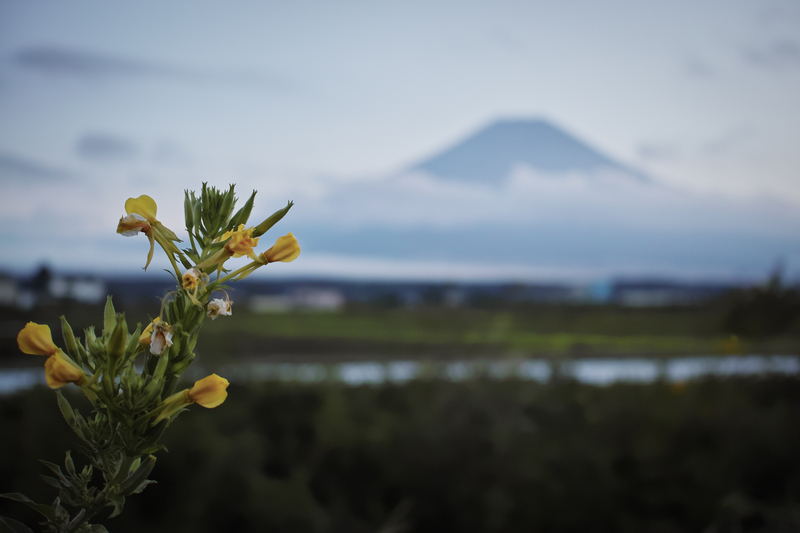 Fuji, Photography and tagged evening primrose, fuji, mount fuji, Osamu Dazai, Oshino, 太宰治, 富士, 富士山, 忍野村, 月見草 on 08/22/2014 by yuga.